Heat griddle to 375°F or 12-inch skillet over medium-low heat. (To test griddle, sprinkle with a few drops of water. If bubbles jump around, heat is just right.) Grease griddle with vegetable oil if necessary. In large bowl, mix Bisquick mix, milk and eggs until blended. For each pancake, pour slightly less than 1/4 cupfuls onto hot griddle. Cook until edges are dry. Turn; cook until golden. Cool completely. Meanwhile, in large bowl, toss strawberries with melted jelly to coat. In large bowl, beat cream cheese and sugar with electric mixer on medium speed until smooth; slowly add whipping cream. Increase mixer speed to high and beat until light and fluffy. 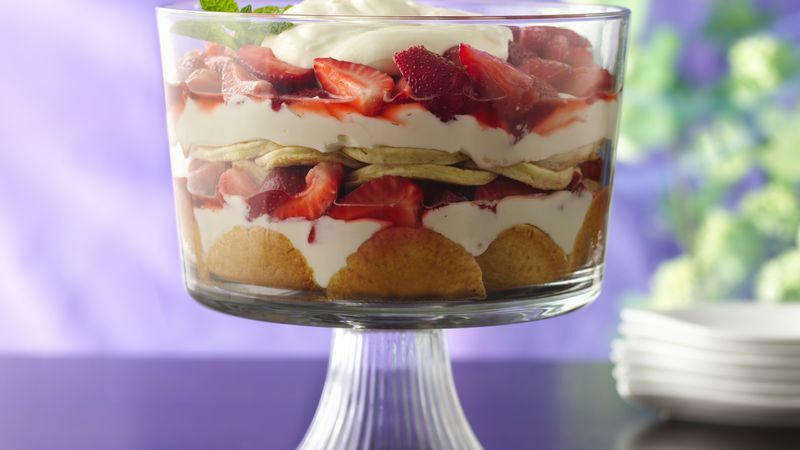 In 3 1/2-quart glass trifle bowl, arrange half the pancakes in bottom. Set aside 1 cup of the cream cheese mixture. Spoon half of the remaining cream cheese mixture over pancakes; top with half of the strawberry mixture. Repeat with remaining pancakes, cream cheese and strawberry mixture. Top with reserved 1 cup of cream cheese mixture. Garnish with additional berries and mint, if desired.